Government repression in the wake of disputed election results has intensified following the army's indiscriminate use of live ammunition which killed at least 6 protestors in the capital Harare on August 1. Amnesty International has denounced "a vicious campaign of torture, intimidation and suppression of dissenting voices." 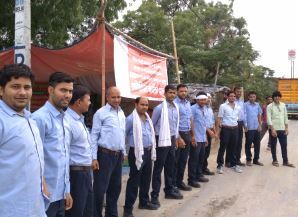 Tea workers in West Bengal held a three-day strike on the tea plantations August 7-9 in response to a deadlock in wage negotiations and the government's refusal to apply the Minimum Wage Act to workers on the tea estates. 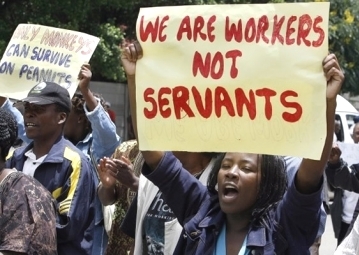 Tea workers are excluded from the Minimum Wage Act and instead subjected to tripartite agreement at the state level that perpetuates starvation wages. 2017 was a year of record violence against environmental and land rights defenders, according to a recent Global Witness report, and agribusiness has surpassed mining as the most dangerous sector. Antimicrobial resistance (AMR) - the development of 'superbugs' resistant to antibiotic treatment - has emerged as a major global threat to public health. Yet worker health and safety has been almost completely ignored in the global fight against AMR. The case of Dewayne Johnson v. Monsanto Co. is now underway in a San Francisco, California federal court, two-and-a-half years after the lawsuit was filed. The presiding judge has ruled that jurors may consider evidence concerning Monsanto's efforts to conceal the potential toxicity of the product in reaching a verdict. The scope of potential liability for glyphosate makers is therefore enormous. July 19 marks the anniversary of the 1979 overthrow of the US-backed Somoza dictatorship. 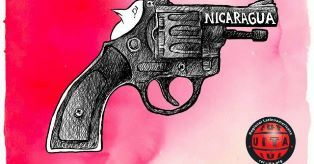 The democratic promise of the Sandinista revolution, which resonated throughout the region and the world, has been progressively confiscated by the autocratic rule of President Daniel Ortega, whose government has been brutally repressing popular demonstrations as it indulges in ritual celebration. Stop the attack on rights at Cargill Turkey - Reinstate #TheCargill14 now! Fourteen union activists have been continually protesting after being unfairly dismissed from their jobs on April 17, 2018 while organizing a union at Cargill-Turkey's corn-milling facility in Bursa-Orhangazi. CLICK HERE TO SEND A MESSAGE TO CARGILL! Read more about Stop the attack on rights at Cargill Turkey - Reinstate #TheCargill14 now! The UK trade justice organization Traidcraft Exchange has launched a public campaign calling on the 6 tea companies which together account for over two-thirds of UK tea sales to disclose the plantations they source from in Assam, India. We support the call for transparency. Read more about Who picked my tea? Two migrant farmworkers on a tobacco farm in North Carolina were abused, denied work and then summarily fired after describing substandard living conditions to an inspector from the state Department of Labor. 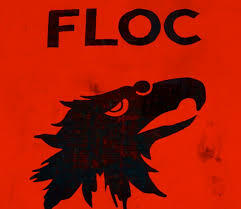 Our affiliate, the Farm Labor Organizing Committee (FLOC), is supporting the workers in their conflict with the grower and is seeking to recover thousands of dollars in stolen wages. 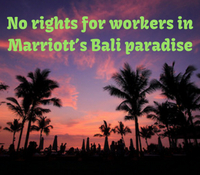 CLICK HERE to send a message of protest to the grower, his anti-union lawyer and the tobacco giants! Norway: Stop union-busting at processed fish exporter Sekkingstad! Norway's Sekkingstad AS, a salmon and trout processor which exports to retail customers in over 50 countries, is trying to roll back a successful struggle by the Norwegian Food Workers Union NNN, which last year won recognition and a collective agreement at the company's processing sub-contractor following a 35-day strike. CLICK HERE to tell Sekikingstad to stop union-busting! Read more about Norway: Stop union-busting at processed fish exporter Sekkingstad! 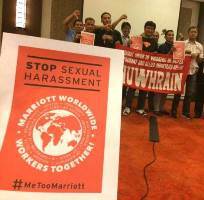 On June 27, IUF members at Marriott hotels around the world demonstrated in support of the union call for concrete action by the world's largest hotel group to protect workers from the endemic sexual harassment which afflicts hospitality workers. 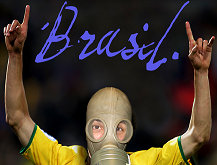 Despite mass opposition, Brazil's notoriously corrupt Congress has paved the way for a vote on easing authorization for still more pesticide use in the country which is the world's largest consumer of toxic agrochemicals. Brazil's already low standards of pesticide protection permit the massive import of dozens of chemical products like paraquat whose use is prohibited in their countries of manufacture.